A system which refuses to pass spatial frequencies beyond a certain limit: all optical instruments. See Band Width. How far above and below the in-focus region should I sample? This question can be particularly relevant for widefield microscopy. Widefield images are fuzzy in the neighborhood of the in-focus region, which rises the question of how far above and below the in-focus region (Z direction) the image should be recorded to ensure an optimal deconvolution result. For a good widefield deconvolution it is not necessary to acquire large regions above and below the in-focus zone. In widefield microscopy the blur can spread through large regions. The Huygens algorithms take this into account, thus imaging very far above and below the in-focus region is not necessary to achieve good deconvolution results. The image can be cropped far from the in-focus region to speed up the deconvolution process. To avoid cropping slices that contain useful information, leave a border of around 1-2 Half Intensity Width sizes. As an example, in widefield, well-sampled images recorded with NA 1.3 this corresponds to 0.75 to 1.5 microns. A confocal image deconvolution already benefits from including a few planes. Even including one neighboring plane on each side of the plane of interest gives already an improvement in resolution and signal. However, if a realistic representation of an object in the plane of interest is required, it is advised to image at least a Z-stack that matches the dimensions of the PSF. You can calculate this with the calculator on NyquistCalculator. For larger objects you would want to have at least a number of Z planes that matches half the axial width of the PSF on both sides of the object. What are the pros and cons of piezo-electric vs step motor focusing control? As a rule piezo-electric focusing devices have far greater positioning accuracy. For example, older stepper motor driven stages already have trouble positioning with a 0.5 micron accuracy while good piezo stages are better than 10nm. On the other hand, modern stepper motor setups claim 0.1 micron 'accuracy' which in principle is sufficient for many applications. Whether the accuracy is really sufficient depends on factors like the maintainance state of the microscope, age of the lubricants in the gears, and so on. Piezo driven focussing systems are also not without problems: hysteresis, temperature drift to name a few. To compensate for the latter, especially in cases where experiments are to be conducted at 37 degrees, we recommend a sensor feedback system. Do I need to use all three channels when observing through a broad bandpass barrier filter? If you are using a monochrome camera you have one channel to which you assign the peak of the fluorescence emission spectrum. If that peak is cut off by the bandfilter, the effective emission wavelength at the detector will be close to the filter cutoff wavelength. If on the other hand you are using an RGB camera, the situation is a bit different. Each of the camera components has its own, probably not so sharp band filter. The camera filters are in cascade with the microscope bandfilter. Suppose the microscope filter passes all wavelengths longer than 500nm, and the blue camera filter passes all shorter than 500nm, then the Blue channel will be dark. In a different case, suppose the microscope filter passes all wavelength longer than 570nm, the green camera filter from 500-600nm, and the red camera filter from 580nm and longer. Then both Green and Red channel contain an image. With little loss of accuracy these could be added and deconvolved at 570nm emission wavelength (you need Huygens Pro for that). In the most likely case two of the three R, G, B channels will contain only a very dim image. You might as well discard these and concentrate on the brightest image. What do you mean by the mounting medium? The embedding medium in which the sample is mounted. We also include an immersion medium field to account for water immersion lenses. Which pinhole size to use in case of mechanical hysteresis? Start with the smallest pinhole. This gives the smallest PSF resulting in the most conservative restoration (less artifacts). If you are not satisfied with the resolution you may wish to increase the pinhole size. May I clip bright pixels which dominate the scene? As a rule, it is never a good idea to tinker with the greyscale of an image prior to deconvolution. For example, if one would clip the bright pixels in an image the in-focus image of the object will not correspond anymore with the non-clipped blur it causes. In the restoration this usually results in insufficient blur removal. A different thing applies for Hot Pixels. These can be removed effectively with the Hot Pixel Remover. Nyquist rate - What's arcsin/asin? How to compute the back projected pinhole radius? For more information see BackprojectedPinholeCalculator. Is there a formula for the backprojected pinhole radius in Biorad confocals like the MRC 1024 or the Radiance? with r the backprojected radius in nm, d the pinhole diamater in mm, the system magnification, the objective magnification. The "2" is for diameter to radius conversion. Depending on the configuration the system Magnification for the MRC 600 or 1024 is 53-83. The system magnification of the Radiance is reported to be 60. What does the message: 'total reflection at glass/medium interface (...)' mean? The message means that a refractive index of 1.14 can't be combined with an NA of 1.2 because according to Snell's law NA = r.i. x sin(alpha) and sin(alpha) <= 1 so NA < 1.14 when r.i. = 1.14 for any lens. If you specify an NA which is higher than the r.i. of the medium, then this implies total internal reflection at the glass/medium interface, causing the oblique angles of the excitation light to be reflected back into the microscope, thereby reducing the effective NA. I have heard that imaging diatoms is a difficult task, why? I intend to obtain some diatoms which have detail in the sub-micron range and which have 3-d structures. It should be possible to image them by immersing them in a fluorescent medium and model their appearances using different algorithms to find which one gives the best approximation of the real appearance of the diatom (as determined by scanning EM). Imaging diatoms is indeed a difficult task. This is so because the skeleton of diatoms has a high refractive index and can seriously spoil light propagation, resulting in a PSF which varies strongly from place to place. Should PSFs be produced for different wavelength when working in the visible light range? It is a good idea to do this. Often we see considerable shape dependencies in confocal PSFs, also in widefield PSFs. What emission wavelength to use to represent the detected spectrum? The detector is seeing a broad spectrum of light, exactly what this is will depend on the filter characteristics prior to the detector. We once did some simulations where we integrated the PSF(s) over the wavelength band of the dye spectrum and compared that to the PSF of an 'effective' wavelength: a last decimal case. A good estimate of the effective wavelength is the centre of mass of the spectrum, but since the main part of the spectrum is roughly symmetrical and effect of a slight error on the PSF shape is minimal, the peak value is also fine, or the mean between bandwidths. In case of long pass emission filter, there is no mean (one bandwidth goes to infinit), and the peak may not be the correct. In that case the center of mass needs to be estimated. Read more at Emission Wavelength where images explain the difference. What to use as excitation wavelength: laser line or fluorescence spectrum peak? The laser line: that is the light actually going through the optics. What is the refractive index of the embedding medium Vectashield? What is the refractive index of the medium? In the form for optical parameters, there are two fields for Refractive Index. One is for the oil (oil immersion objective), the other for the medium. Is this the medium in the samples like DAKO or glycerol? The other, the medium between the samples and objective? Yes! If you enter a figure not much lower than the NA you'll see it gets highlighted to warn you against an optically poor situation. Photon counting - why do people sometimes question its practicality? Low light level images of say maximal 25 photons per pixel will naturally yield pixel values which are low with respect to a ccommon range of 0.255. That does not mean the image is poor in the sense of a poor Signal to Noise Ratio (SNR). Since SNR = sqrt(maxPixelCount), it is easy to compute the SNR from a photon counted image: in this case 5. Images with SNR 5 can usually be quite well restored. A raw 1 micron bead looks very elongated along the optical axis. Why? A measured 1 micron latex bead was sampled at 100nm in all directions. In the original image (assuming typical microscope conditions, 1.3NA, 500nm excitation wavelength) the bead should have an axial size of roughly 1.8 microns axially and 1 micron laterally, so 18 samples axially and 10 samples laterally. do a 'to/from optical representation' (restoration menu) to shift the origin of the image to the center. to make things realistic you can throw in some Poisson noise. The result should not be too different from the measured image. Which wavelength do I have to set for multi-photon excitation? In order to generate or reconstruct point-spread functions Huygens needs to know the excitation wavelength in nanometer. For multiple-photon excitation use the actual wavelength (e.g. 780 nm) and specify 2 for the "number of excitation photons" in the parameter dialog. The model assumes that all participating photons have the same wavelength. Which pinhole size to use in the Leica SP2 confocal microscope? I am using Leica TCS SP2 confocal microscopy. The pinhole setting is 1 Airy, which is about 82um. This information is obtained directly from Leica software. But When I was using Huygens essential, it told me the pinhole size is too large. I also looked at the users guide, found this formula r=0.61*lambda*N/NA. According to it, I got 238nm. Could you tell me what I should choose? The pinhole measure as used by Huygens is the "backprojected pinhole RADIUS", which means that the physical size should by divided by the systems magnification factor. Using a 100x objective lens the value is 410 nm, which is still pretty high (250 nm is a common value), so maybe there is some more internal magnification in the system we are not aware of. Using the Airy-disk unit prevents you from having to know about magnification settings so 238 nm is the one to use. How to estimate the back projected pinhole value from the Airy Disk size? NA = the numerical aperture, number_of_Airy_disks = the number of disk diameters fitting in the pinhole diameter. The Airy disk diameter is the diameter of the first dark ring of the diffraction pattern in the focus of a lens, the so-called Airy disk. When is the RI / NA combination correct? When light passes from a dense medium (glass) into a less dense medium (water) total internal reflection occurs above a certain angle of incidence. High aperture objectives easily generate rays at angles beyond this limiting angle. When the refractive index of the medium is below the objective's NA this will occur. Example: with an NA = 1.4 and a watery medium (refr. index slightly above 1.3), the most oblique rays cannot pass into the medium and will be totally reflected, effectively limiting the NA of the objective. See also: What does the message: 'total reflection at glass/medium interface (...)' mean? And see the wiki article Numerical Aperture. How to calculate the X and Y sample sizes using a CCD camera? Find out the pixel sizes of the camera's CCD chip. Typical values are 6.7 x 6.7 micron. With a 25X objective the XY sample sizes will be 6700/25 = 268 nanometer. This is assuming that there is no extra magnification. If the microscope has internal magnification that should must be considered. In that case, the total magnification (all magnifications multiplied) must be used when calculating the pixel size. Do you know of any suitable solid mountants with suitable refractive indices? Customers noticed that small microspheres undergo Brownian motion in glycerol and water. We have heard of people using polylisine to attach the beads to the glass, but there are probably a dozen more tricks we are not aware of. When deconvolving 2-photon data what microscope type should we choose? If there is a non-descanned detector (NDD), or a very large (say > 10 Airy disks) pinhole, the contribution of the pinhole to the image formation can be ignored. In this case the microscope type can be widefield in combination with 2p photon. This will result in more realistic values for the Nyquist rate than a confocal setting. If there is a pinhole in the order of a couple of Airy disks, typically 500nm backprojected radius, it must be taken into account. So in this case the microscope type should be set to confocal. The PSF looks "banana-shaped" in the x-z or y-z planes. What could be the reason? We have seen this many times. Please see Banana Psf. How do you measure the Numerical Aperture (NA) from the experimental PSF? It is more like estimating. 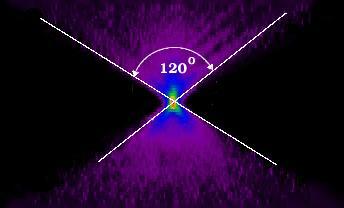 Just look at the angle of the blur-cone fanning out from the bead along the optical axis (Z). The largest angle is the aperture, whose half (α) you need to use in the Numerical Aperture definition. Usually it can be easily seen in XZ slicing mode. A 1.3 NA oil lens should show α = 60 degrees with the optical axis, making the total cone angle 120 degrees. Often it is less! It is a sure way to spot optical or calibration problems. The shortcoming of this method is that you can't discriminate directly between errors in the sampling calibration or the effective NA. However, if there is remarkable asymmetry then it could be explained by Spherical Aberration (see Mismatch Distorts Psf). Assuming the lens is good, this must be caused by a Refractive Index Mismatch. In turn that will lead to a reduction in effective NA. So in these cases a refractive index mismatch is at least one of the factors causing the problem. How to immobilize a sample with agarose or gelatin? There are many different types of agarose and gelatin, and they may not be equally suited for embedding of light microscopy samples because of autofluorescence, light scattering etc. Are there any special brands of material or protocols/publications for purification/embedding available? Or any other material keeping suspended samples (like beads) in place in three dimensions? I use gelatin to simply immobilize my sample (suspend it in place in 3-dimensions) which will otherwise tend to "swim away" in an aqueous medium. I do not notice any autofluorescence in the 5% gelatin. What are the characteristics of the Confocal, Widefield, Multiphoton (and other) modules? Please read the page which explains the module options. Which pinhole size should I set for best results? The axial resolution of a confocal microscope is inversely proportional to the pinhole size. However, as the pinhole becomes very small, so does the detection efficiency. Generally a good compromise between sensitivity and resolution is found at a diameter of one Airy disk unit. In practice, depending on wavelength, for a 1.3 NA objective this corresponds to a backprojected pinhole radius of 200nm to 300nm.